Never lose track of this project! ‘Like’ it on facebook and PIN IT, so you’ll always be able to find it. Check out these garden alligators. On a quick glance they could actually pass as real. And if you live in Florida, your neighbors might be calling animal services to report these creepy crawlers in your yard. Fortunately, no one need worry about losing a leg, arm, or head. 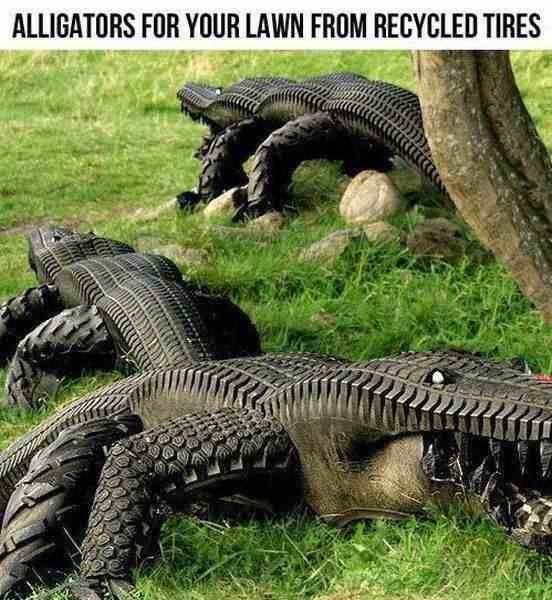 These alligators are the work of Swedish artist Eric Langert (http://www.langert.se/) and I think they’re the coolest thing ever and a very creative way to upcycle some old tires. If you want to make your own, you’ll need several tires in different sizes. Cut open the largest tire and flatten it out. The larger the tire, the longer the alligator. Cut one side open and cut in the teeth. Use the smaller tires for the arms and legs and attach them to the body using a heavy epoxy. To bend the arms and legs, make a slit in the tire where you want the joint to be, bend the joint and epoxy it in place. You can also keep your alligator standing (see the rear alligator). To do this, cut the small tire into quarters and epoxy it on the way it shows in the picture. p.s. Always find this project by pinning it & liking on facebook. Then stay tuned for more fun & fabulous DIY ideas and inspirations! CHECK OUT POSTS GONE VIRAL! HOW TO RESTORE CLOUDY HEADLIGHTS TO SPARKLY NEW…For Under $15!!!! DIYFunIdeas.com is a participant in the Amazon Services LLC Associates Program, an affiliate advertising program designed to provide a means for sites to earn advertising fees by advertising and linking to amazon.com.